Born and raised in Skälderviken, an old fishing village just outside of Ängelholm in the southern part of Sweden, Jörgen graduated from secondary school deciding not to go to college. He had discovered something much more interesting. 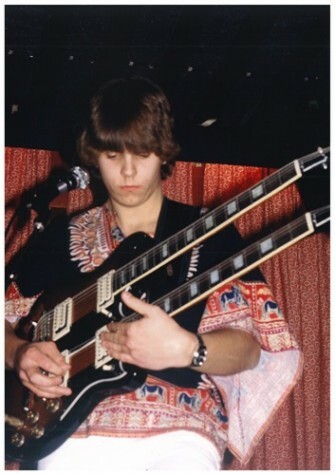 At the age of sixteen, he got his first real six-string. I got a guitar of my own and started learning how to play. At home, my mother used to read weekly magazines and some of them had poems published, which I began to set to music. Influenced by the Canadian rock band Rush, still today his favorite, Jörgen wanted to become a guitar hero. With that in mind, he joined several local groups between 1978 and 1986. In chronological order: Air, Egon Pretty Band, Art Light, Garbo and Sitting Ducks. In 1980, Egon Pretty Band, with Jörgen on vocals and guitar, released this song titled “Åh, Helen” – Jörgen’s first single. In August of 1987 Jörgen made the decision that would come to change his life. He wanted to record four demo songs in a professional music studio, but could not afford the cost. So the next stop was the bank, where he managed to get a loan for $1,000. After signing the papers, things began to happen fast. Only a few months later Jörgen signed his first record deal, with CBS. A solo career under the artist name “Shane” was launched and the first single, “Dance With Another”, lifted from his 1989 debut album, “Man in Me”, was released. All songs were recorded at ABBA’s world famous Polar Studios in Stockholm. Over the next four years, Shane released several singles and a second album, “Hold On”. He toured Eastern Europe and found success in countries such as Poland and Romania. However, in 1993 the artist known as Shane came to an end.